Today we Goldkk.com will be putting together an overpowered hybrid squad builder, we’ll show you the best team in FIFA 19 Ultimate Team which is very cheap that only cost 400K Fut coins. This can not only be used as a Fut Rivals squad builder but also a Fut Champions squad builder. It has players from Premier League, Bundesliga and La Liga. And we’re going to use the FIFA 19 formation 4-3-3(4). I’d have to say that this 400K Hybrid Squad Builder is one of the best teams on FIFA 19. Why you should pick up this unbelievable Fut team? Let’s take a look at the players review. I’ll introduce you all the players skills in the 400K squad builder hybrid and how much do they cost. Depay: The striker of the team with 85 ratings. He’s become the IF player. He does make a lot of runs, 90 pace, 83 shooting, 83 passing, 85 dribbling makes him very strong in the game, and he has a decent finishing at 80, shot power at 90, curve at 90. Price: 161K (PS4), 168K (XBOX ONE), 180K (PC). Neuer: The goalkeeper of the team, he’s a little expensive that cost about 50K FUT coins, but I think he’s actually worth it. He played extremely well. Really tall and quite good on one-to-one situations. He’s at the top of all goalkeepers with 91 diving and 88 reflexes. Because of his position, he always stands out in the competition. 91 kicking allows him to launch a long-pass attack directly in the backcourt. His playing style gives the impression that there is an additional guard on the court. Boateng: The center back who gets a perfect link with 86 ratings. 85 defending shows his tough tackle and defensive wisdom, while the 83 physicality can push back and try to challenge his opponent. He’s really strong and aggressive in the game. Price: 62K FIFA 19 coins (PS4), 50K (XBOX ONE), 64K (PC). Joao Cancelo: He’s a Portuguese professional footballer who plays for Italian club Juventus and the Portugal national team. Mainly a?right back, he can also play as a right winger or as a left-back. 81 rated with 88 pace and 81 dribbling, really good on the attack and not bad at defensively. He’s gone done and priced to about 3K FIFA coins. Naldo: He’s 6 foot 6, so extremely tall. He’s 86 rated with 87 defending, 74 physicality, 92 shot power, 90 standing tackle, really aggressive in the game. He can win a lot of headers and for about 17K FIFA 19 coins PS4. Filipe Luis: The left back in the team with 85 ratings. He’s not the quickest player but defensively he’s really good for a fullback. 81 defending, 79 dribbling, 78 passing, and 6 feet tall as well so quite tall for a fullback, and defensively does the job quite well and only about 13K coins (PS4), 14K (XBOX ONE), 17K (PC). Casemiro: One of the best midfielders in La Liga. He’s got 87 defending, 88 physicality, and 75 passing can take advantage of each other at any time. And he intercepts a lot of balls, a very solid card. Price: 35K (PS4), 34 (XBOX ONE), 41.5K (PC). Matuidi: The CM in the team with 85 ratings. He’s got a well-rounded card almost every step above 70. 83 defending, 83 physicality really does help a lot at defensively. And 78 pace makes him very quick in the game. Price: 50K FUT 19 coins (PS4), 33.5K (XBOX ONE), 62K (PC). Fekir: He’s mainly in there for chemistry but still performed quite well. He’s got 82 shooting, 89 dribbling, really fast on the ball, really high agility and decent fishing at 82. Price: 9.2K (PS4), 9.4K (XBOX ONE), 11.5K (PC). Cuadrado: The right-wing of the team with 84 ratings. This is a very sweaty player with 5-star skill moves, 74 shooting, 87 dribbling, insanely quick, not the best finishing but he can get into a lot of positions. He’s very cheap that only cost about 6-7K FIFA coins. Promes: He basically has everything for a winger, 90 pace, 83 shooting, 89 acceleration, very good finishing at 86, 91 sprint speed. He’s so fast in the game. I highly recommend this player that you can buy. And he’s very budget that only cost around 3K Fut coins. Once we've put all the players in the team, it works very nicely. So want to buy Fut coins to build this 400K Fut Hybrid Squad? 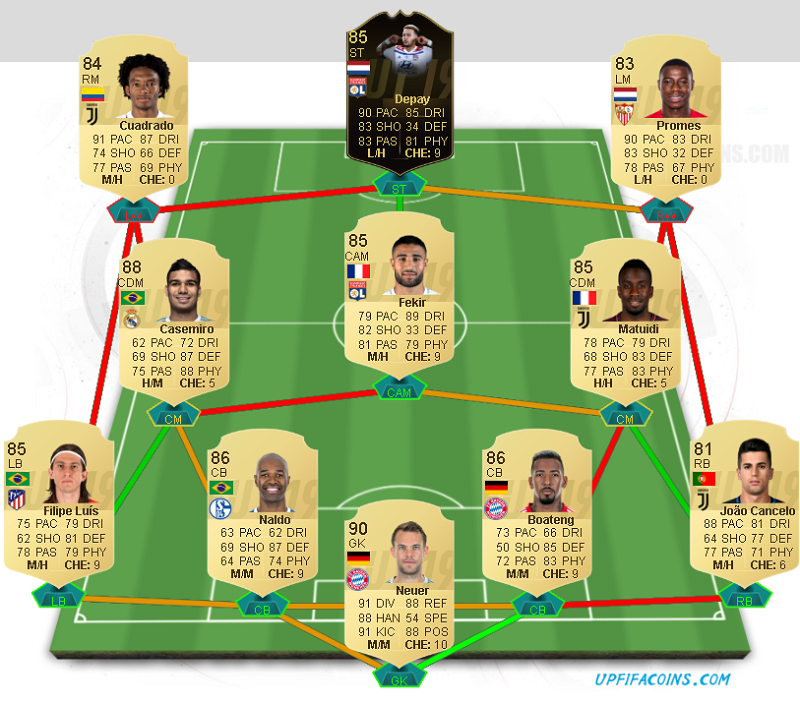 Want to get best FIFA 19 squad builder? Goldkk.com is selling cheap FIFA 19 coins PS4, PC, Switch and XBOX ONE!